You’d think a string of violence at his rallies would leave Trump vulnerable. It hasn’t. Late in Thursday’s Republican presidential debate, CNN’s Jake Tapper asked Donald Trump about the disturbing trend of mob violence at his campaign events, which reached a crescendo this week when a North Carolina man was arrested for assaulting an attendee who was being led out by police. This followed the alleged assault on Tuesday of a reporter by Trump’s campaign manager, Corey Lewandowski, though Tapper did not ask about that. The GOP front-runner simply shrugged off the question and gave a remarkable answer where he vilified the protesters, not their violent assailants, and also praised law enforcement. We have some protesters who are bad dudes, they have done bad things. They are swinging, they are really dangerous, and they get in there and they start hitting people. And we had a couple big, strong, powerful guys doing damage to people, not only the loudness, the loudness I don’t mind. But doing serious damage. And if they’ve got to be taken out, to be honest, I mean, we have to run something. And it’s not me. It’s usually the municipal government, the police because I don’t have guards all over these stadiums. I mean, we fill up stadiums. It’s usually the police—and, by the way, speaking of the police, we should pay our respects to the police because they are taking tremendous abuse in this country and they do a phenomenal job. This naked authoritarianism is perhaps not surprising for a candidate whose campaign is centered on a pledge to eject 11 million undocumented immigrants from the country and building a wall on the entire southern border. He also comically referred to the Tiananmen Square protests as a “riot” earlier in the debate. But what happened next was truly surprising: None of Trump’s rivals, who are desperate for any way to get an edge on Trump before it’s too late, went after him. Instead, they validated his answers. 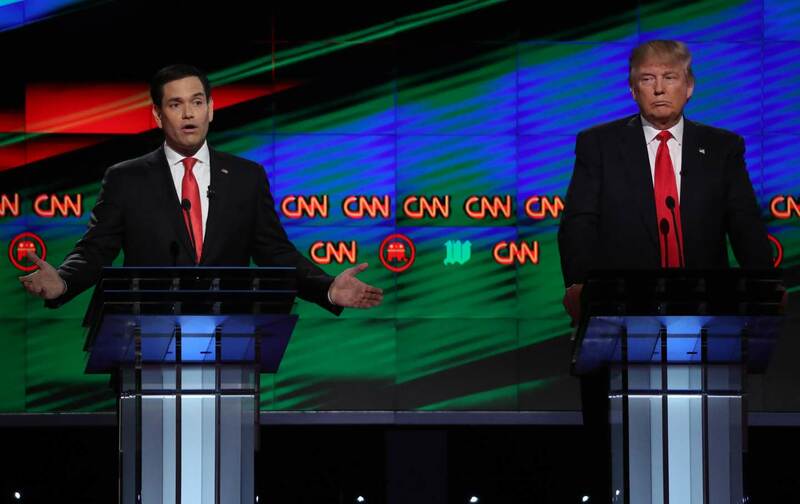 Marco Rubio expressed concern about violence—but primarily against police officers. “The first is, I’m concerned about violence in general in this society. And by the way, the first people that are facing that violence are our law enforcement officers. And they deserve our respect and they deserve our thanks for everything they do for us,” he said. We may not see Rubio and Kasich on a debate stage after Thursday night, and this particular episode is a fitting coda for the establishment’s preferred candidates. The GOP can’t stop Trump because, contrary to any protestations, he isn’t hijacking the party. He’s just giving voice to its worst elements. Maybe it would be impossible to neutralize Trump’s appeals to the lowest common denominator, and maybe not—perhaps law-and-order tendencies are too deeply baked into the Republican Party’s DNA. After Fox News has spent months demonizing Black Lives Matter as a hate group, maybe it’s impossible to then elicit sympathy for the largely black protesters being ejected and assaulted at Trump’s rallies. It’s an open question. But none of Trump’s rivals want to know the answer.